I only started drawing in my late thirties. I was super-motivated but it was a struggle to learn. I read books, I copied the masters, I looked into classes, but ultimately the only thing that worked — was work. I kept drawing and drawing and, slowly, I figured it out. In retrospect, it was worth all the effort. Drawing changed my life. But I suspected all along that there’s probably an easier way. And every time I’d hear someone say, “I can’t draw, not even a stick figure,” I’d vow to myself that I’d figure out some way to make the process of acquiring this skill (and that’s all it is, like juggling or shoelace tying or bike riding or driving — a skill) easier and more fun. I tried a few times. I wrote about it in The Creative License and again in Art Before Breakfast, I even made a series of crude how-to YouTube videos. But then, this summer, I sat down and really worked it out. I went back and studied my own process over the years, figure out what had worked and what didn’t, I did further research, I consulted experts, and then I made two dozen clear, fun video lessons that explain how drawing works and how to do it, step-by-step. I set my standards high. I avoided jargon, I avoided tedium, I added jokes, and corralled my friends, family and even my dogs into helping. And I decided that the kourse should be something you could do at your own pace, but with the encouragement and support of other people who are going through the same process of discovery and transformation. And then, to make sure that nothing gets in the way of people watching and using these lessons, Koosje and I decided to move this kourse (and ultimately all of Sketchbook Skool) to a fresh new platform that is intuitive and fresh and inviting. Oh, and we’d price it to be even more affordable that our other kourses — so the monkey would have one less reason to prevent people from signing up. Finally, this week, after five months of work, the kourse is ready. I hope it is the first step in launching a lot of extraordinary creative lives. Maybe yours. You can watch the video trailer below. If you’d like to try it, sign up here. Heads up: Even if you have an SBS account already, you’ll need to get a new user name/password to enroll on our spanking new platform. It’s worth it. PS: Someone asked how this kourse differs from “Beginning” at Sketchbook Skool. Yup This is the permanent price for this kourse. Or — Get someone to buy it for you for Xmas! 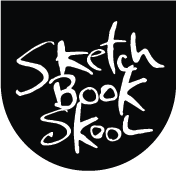 Contact morgan@sketchbookskool.com to get a gift certificate. Not to complain, but I have no one to whom I can make such a request… long story. Signed up and can’t wait to get started!